In the June 2012 issue of Tufts University Health and Nutrition letter I was so excited (no - more like super duper excited) to see a 2-page spread on lettuce!! "If not for lettuce and salads, many Americans would hardly eat any green vegetables at all. Lettuce ranks behind only potatoes and tomatoes (technically a fruit) among the most popular vegetables. A nice, big salad can go a long way toward the two to three cups of daily veggies recommended by the federal government's My Plate, though you should count every two cups of raw, leafy greens as one cup toward that goal." "Plain lettuce, after all, contains 14 calories in two cups. But you can easily turn a "healthy" salad into a plate that's no better for you than a burger and fries. First pile on the leafy greens, then the other vegetable and fruit toppings - for example, shredded carrots, raw broccoli, pieces of fruit. These salad items should cover most of the plate or bowl. After that you need to ask yourself, what else do I really want and what am I willing to forgo? For example, if you really want a bit of the creamy dressing, that's fine but you need to pass up the cheese. If you really want the cheese, then you are going to need to go lightly on the dressing, perhaps with a bit of oil and vinegar or lemon juice." "Deeply colored greens contain vitamins A, C and K, beta-carotene and other carotenoids like lutein and zeazanthin, calciu, folate and of course fiber. Green and red leaf lettuce contain nearly 15 times as much vitamin A as iceberg lettuce, 6 times the vitamin K and 20 times the beta-carotene and 6 times the lutein and zeazanthin. Greens other than iceberg also score higher in measures of phytonutrients, which can act as antioxidants and may combat inflammation and chronic diseases." 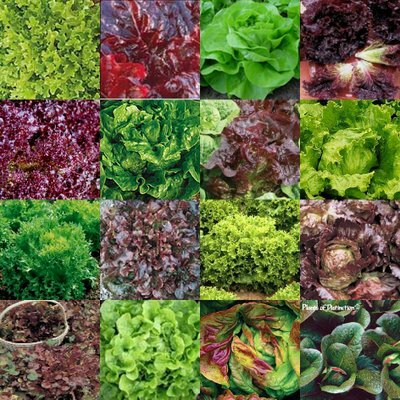 -Start with a milder lettuce like butterhead, red leaf or green leaf. -Toss in a crisp choice such as romaine or cabbage - any type. -Finish with flavorful, peppery or bitter greens like arugula or radicchio or a milder but hearty pick like spinach. " -bag fresh greens to keep separate from faw meats and poultry. -Refrigerate greens at 35-40 degrees. -Wash greens thoroughly under running water just before using, including local or organic. Do not wash with soap, detergent or commercial produce washes. -Blot greens dry with paper towels or a salad spinner. -If the label on the package greens indicates "pre-washed and ready-to-eat", FDA says you can use the produce without further washing." 1) Arugula - part of the mustard family, "rocket" (also know as), has a peppery taste, good source of vitamins A, C and K, folate, calcium, potassium, magnesium and iron. 2) Butterhead - including bibb and boston, butterhead is sweet, mild and tender, often sold in a protective clamshell. It beats leaf lettuce in potassium and folic acid. 3) Cress - in US markets you're likely to find watercress, but other types include curly, upland and land cress. Cress is high in vitamin K and the small green leaves have a bitter, peppery taste. 4) Endive - Also known as Belgian endive or witloof chicory, comes in oval heads that separate into scooplike leaves that are pale yellow because the plants are grown under cover. Endive is smoothly crunchy and slightly bitter; the paler the colore, the midler the flavor. It's a good source of folic acid, vitamins A and K, manganese and higher in potassium than lettuce. 5) Escarole - The frilly leaves range from light to dark green; its bitter quality increases with coloring. The dark color is a clue that it is packed with nutrients - notably vitamins A, C, K and folic acid. 6) Frisée - A curly version of endive, with frilly, yellowish-green leaves (the color varies depending on how much the developing plant is shielded from the light) and typically a more bitter taste. It's often sold as part of "mixed greens" to add variety and texture to salads. 7) Leaf lettuce - These large ruffled leaves have a mild flavor and can be either all green or highlighted with red. Either red or green, little nutritional difference. Red leaf is slightly higher than vitamin C while green leaf has more vitamin K.
8) Mâche - Also sold as lamb's lettuce, field lettuce or corn saald, this unusual, nutty-tasting green's delicate leaves belie its nutritional might. It's richer than ordinary lettuces in iron, potassium, vitamin C and folic acid and is a natural source of the plant form of omega-3 fatty acids. 9) Mesclun- Not a true lettuce variety, this is French for a mix of tender young greens - typically chervil, arugula, leaf lettuce and endive. 10) Mizuna - a Japanese mustard green that has a pungent flavor (often in salad mixes), with smallish, jagged, oak-like leaves. It's high in folic acid, vitamin A and other carotenoids and vitamin C. As with other members of the mustard family, it's related to broccoli and like that veggie contains sulfur compounds called glucosinolates that are being researched for anti-cancer properties. 11) Oakleaf - A looseleaf lettuce whose large leaves have an oak-like shape, oakleaf comes in green and reddish varieties and is easily mistaken for green or red leaf lettuce. Its more delicate with a softer texture at the top and is actually a type of butterhead lettuce. It's rich in minerals and vitamins A, B, C and E.
12) Radicchio - another member of the chicory family, it stands out for its red-to-purple color. The bitter taste turns sweeter when cooked. It's a good source of vitamin C and potassium. 13) Romaine - Most familiar from Caesar salads, this large, leafy lettuce can add crunch. It tops all lettuces in lutein and zeazanthin, which promote eye health. 13) Spinach - besides the canned and cooked spinach familiar to Popeye cartoons, raw spinach makes a hearty, slightly bitter salad staple. Baby spinach is more tender and blends more readily into mixed salads. It's among the the healthiest vegetables of any type. Two cups of raw spinach deliver more than 25% of your daily value for vitamins A, C, K, folate and manganese. 14) Tatsoi - Also called spoon cabbage and rosette bok choy, tatsoi resembles baby spinach and has a mild, mustard like taste. Nutrients include vitamin C, potassium and calcium. I'm all about a plant-strong diet but as you know - it's all about balance and with an array of foods out there, there's wiggle room for everything at times. I eat for health to prevent risk for disease and for fuel to support my love for triathlons, activity and to live an exciting and busy life. For me, when I eat I feel better afterward than when I started - regardless if it is a dessert with Karel when traveling, a pizza dinner with friends or my every-day creations (from morning to night). Every food can fit into a your daily diet so rather than thinking about each seperate food in terms of calories, think about nutrient density. As you can see from the list of lettuce (which is just some of the many types of greens), there are many nutrients ranging from calcium and potassium to folate and vitamin E found within green plants.....and I didn't even discuss the nutrients found in food sources covering all the colors of the rainbow! So next time you choose the granola bar, sport drink or enhanced-vitamin water to support your active lifestyle needs or find yourself overlooking the importance (or perhaps, excusing/rewarding "x-foods" because you just worked out) of your selections of foods for meals and snacks (as an athlete or fitness enthusiasts), why not head over to the produce department of your local grocery store (or better yet - your local farmers market) and stock up on some amazing sources of vitamins and minerals to support metabolism and overall health.